The trailer of this movie was instantly engaging. 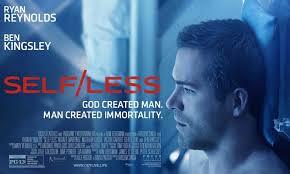 The concept was a really intriguing one… especially considering the long history humans have in wanting to prolong life. I did find Damian to be quite a sympathetic character. Despite starting out as a typical character, an older man with more money than he knows what to do with and not long to live, the strained relationship he has with his daughter and his attempts to find humour in his situation give the character more depth. After Damian is put into his new body, the film does a good job of showing his idyllic lifestyle. It’s understandable that someone who was dying not that long ago would take advantage of a new lease of life. It’s clear very early on that the situation isn’t as perfect as it seems. The moment Damian wakes up in his new body, he starts having hallucinations. He’s given pills to take, but doesn’t ask more about them… which would probably be wise. I felt Ryan Reynolds did a really good job portraying Damian in his new body. There were moments he also portrayed Mark and even though I imagine it must be very hard to play two different people who look the same, I felt he did a really great job as both of the characters. I thought Anna was really sweet and it was nice to see evidence of how close she was to her father. It was also good to see Damian growing close to Anna… almost as if he had a second chance to be a father. It was good to see Damian’s age and experience come through and that he was able to outsmart some of the others. At the same time, he didn’t have perfect skills and there was a really good balance. The atmosphere of this movie carried a lot of tension and I found myself rooting for the ‘good guys’ almost from the start. It was also nice to see that there wasn’t any forced romance. The one scene that could have turned into that was handled really well. I did find the ending to be quite bittersweet… but I felt that was the best route for it to take. I also felt there were some really good elements of foreshadowing. On the whole, this film might not have been realistic… but it was entertaining to watch. I can also see myself buying this on DVD to watch again.